00:10:00 Makes 12 servings, 1 piece (51 g) each. Makes 12 servings, 1 piece (51 g) each. The classic combination of peanut butter and jelly meets everyone's favourite marshmallow crispy treats! 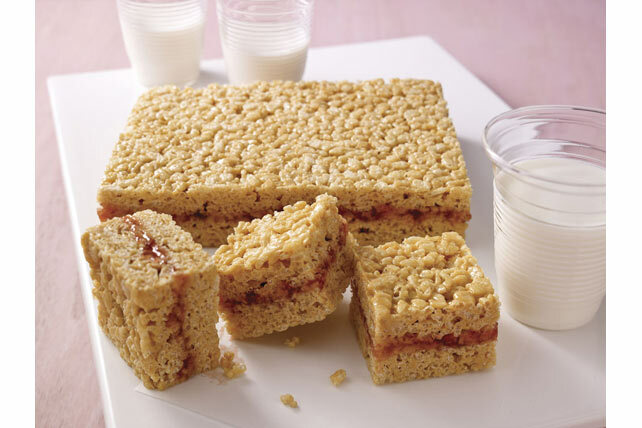 These PB & J Crispy Treats are delectably delicious and oh-so-easy to make. Microwave peanut butter in large microwaveable bowl on HIGH 1 min. or until melted. Add marshmallows; toss to coat. Microwave 1-1/2 min. or until marshmallows are completely melted and mixture is well blended, stirring after 45 sec. Add cereal; mix well. Press half the cereal mixture onto bottom of 8-inch square pan sprayed with cooking spray; spread with jam. Cover with remaining cereal mixture, pressing firmly into pan to secure. Cool completely before cutting into squares. Substitute warmed grape jelly for the strawberry jam. Serving Size Makes 12 servings, 1 piece (51 g) each.